These are mentioned because while not appropriate for a WW2 setting these records are sometimes seen with other 78 records. 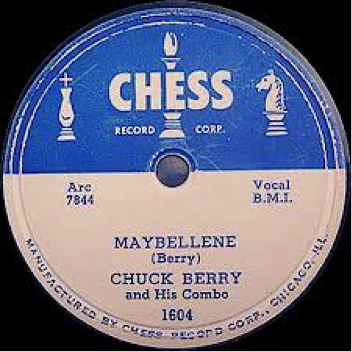 Sun, Chess, and Vee-Jay record companies all produced rock and roll music. Early rock and roll artists first appeared on a 78 record, post-World War 2. Shortly thereafter (late 1940s/early 1950s), record companies made the switch from 78 in Shellac to the 45 format in vinyl. Though, Britain continued to produce 78s until the early 1960s. The Beatles, Chuck Berry, Muddy Waters did their first recording on a 78 as did Elvis Presley. Presley first recorded on the Sun label. Record Label: Early Sun Record in a 78 format. Would make the switch to a 45 format in early 50s. Record Label: Vee-Jay records in a 78 format. Record Label: Example of a 45. Note the larger opening. Record Label Post WW2: Often the MGM record will be a quad-center with or with-out text on the quad-center. Record Label Post-WW2: No quad-center just a large hole. –Rust, Brian. The American Record Label Book. Arlington House Publishers, NY. 1978. –Sutton, Nauck. American Record Labels and Companies: An Encyclopedia (1891-1943). Mainspring Press, CO.2000. Founded as Victor Talking Machine Company in 1901. The phrase “His Master’s Voice” appears on discs in 1902. Marketed a Victor Monarch Record label (1902-1905) and a De Luxe Label (1902-1905; a De Luxe Special Record that was 14in. was sold from 1902-1903) both would have the dog and gramophone logo. The Victor Monarch Label and the De Luxe Label would also be sold alongside a regular Victor Label or Victor Record Label. First discs were one sided and starting around the 1908 Victor began to produce two-sided discs. Some early Victors from 1905-1913 will say around the rim “Awarded First Prize…” as Victor was awarded first place at expositions. A Red Seal Record series (originally one-sided and then two-sided in 1921) would be introduced in 1903 and last till 1923 the design of the Red Seal record would mimic the regular label. The Red Seal series featured higher end musicians such as Enrico Caruso and cost anywhere between $1-$7.50 which as much more expensive than the regular series records. In 1929 the Victor Talking Machine was sold to Radio Corporation of America and would operate as RCA-Victor. RCA-Victor would produce budget labels like Timely Tunes(#1550-1600) produced between April 1931 and July 1931 and Electradisk (#1900-2510) produced between 1932-1934 for Woolsworth Department Stoes. However, the Bluebird label would be its best. In 1936, RCA-Victor would abandon the scrolled design. 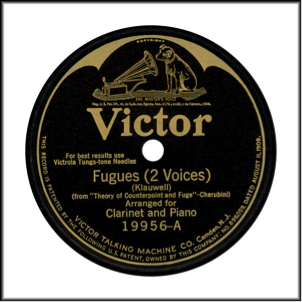 In 1942, RCA-Victor would introduce a 2 digit pre-fix for record series. In 1946 RCA would RCA on all the records making them RCA-Victor. By the late 1940s/early 1950s RCA-Victor would make the switch to 45s and Long Play (LP) discs. Early Victor: 1905-1914 (records from 1908-1914 would feature the word “Patents” at the bottom). Record Label: Early 1905-1908. Note “Grand Prize” in the center. Records from 1908-1914 would feature “Patents” dates/information listed at the bottom of the record. Mid Victor: 1914-1926 the “Batwing” design. 1926-1936 the “Scrolled” design. Record Label: Jan. 1914-Oct. 1926. 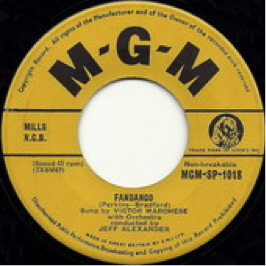 Note the arch (“Batwing”) at the top of label. May be in blue, black, purple or red. Record Label: Oct. 1926-Oct. 1936. Scrolled design. Note the absence of patent numbers and copyright warnings. See also the mention of “Orthophonic Recording” and the “VE” at the bottom/top. This means the recorded has been electrically recorded. May also be in blue, black, red, and maroon. Late Victor: 1936-1946. Concentric Circles with the Victor title label. Record Label: 1936-1946. Note “Circles” on edge of label. May be blue or purple, or red, or maroon, or orange. Record Label: 1903-1923. Red in color with the phrase Red Seal Record at the top. 1941-1945 Label: 1942 label with RCA-Victor. Record Label: 1942. Note the 2-digit pre-fix for the record series and the lack of a scroll design. Note the colorization of the dog. Listen to the Gooney Bird by Homer and Jethro, a pair of country musicians. While not the name of the disk, here is Jim Harkins on Electradisk playing a song called Play Fiddle, Play. -Sutton, Nauck. American Record Labels and Companies: An Encyclopedia (1891-1943).Mainspring Press, CO.2000. 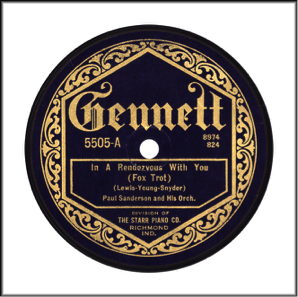 The Gennett label created by Starr Piano Company. The first records produced were under the Starr (1916-1917) label. The Starr label was replaced by the Gennett label. Early Gennett labels were plain but between 1920-1927 they would feature a hexagon. In 1927 Gennett would add the phrase “Electobeam” to its label pressings. Starr Piano would cease selling the Gennett label commercially in 1930 (Gennett would live on till 1934 as a custom label) and concentrate on its budget brands: Champion, Superior, Buddy, and Supertone (pressed for Sears). Superior (#2500-2839) was produced between 1930-1932. Gennett would often press records for other labels/companies. Appears to be mostly re-issues. Label design unknown. Record Label: 1917-1920. Plain. May also be in red. Record Label: 1920-1927. Featuring a hexagon. May be in red, blue, green, maroon, or black. Notes: Many famous musicians first recorded under the Gennett label (Louis Armstrong, King Oliver, Jelly-Roll Morton, Blind Lemon Johnson, Bix Beiderbecke, Gene Autry). 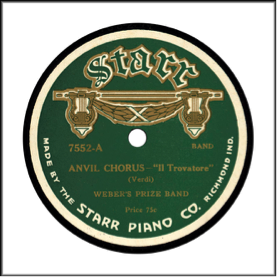 The Starr label was the Starr Piano Company’s first label. The records were produced for one year between 1916-1917 label. The Starr label was replaced by the Gennett label as the company wanted to break into new channels and distance itself from the “Piano” side of the business. 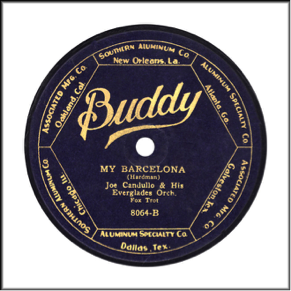 The Buddy Label was produced between 1923-1926 by Starr Piano Company. The label featured companies along the side that had nothing to do with Starr Piano. 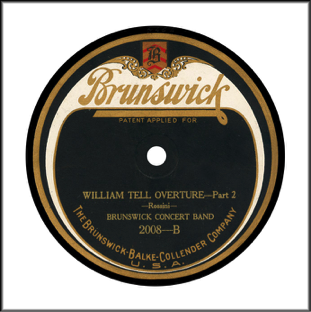 Founded by Brunswick-Balke-Collender Company in 1916. In 1924, Brunswick dropped a multi-colored label in favor a simple black and gold coloring scheme with a shield. In the same year, Brunswick would introduce the Hall of Fame series. The Hall of Fame series would be produced from 1924-1935. Brunswick would buy the Vocalion label in 1925. By 1928, they dropped the “A” – “B” side designations in favor of underlining the preferred side. 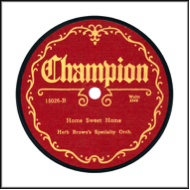 In 1930, Brunswick Records were sold to Warner Bros. Warner Bros. leased Brunswick to ARC in 1931. Records between 1930-1938 would carry a statement that they were “Manufactured by in the USA by Brunswick Radio Corp.”. For an interesting look at the ARC corporate headquarters which housed Brunswick see: this 508 Park Avenue, Dallas blog posting. American Record Company was bought by Columbia Broadcasting System in Dec. 1938. Brunswick would introduce the Melotone budget label in 1930 and CBS would discontinue it in 1938. CBS would discontinue the Brunswick label in April 1940. This violated the lease agreement and resulted in Brunswick being transferred to Decca. In 1944 Decca revived Brunswick mostly to reissue past recordings primarily from the 80000 series as a Collector’s Series (mostly blues and jazz from the 1920s/1930s). Decca would produce the Brunswick label in an LP and 45 formats in the 1950s. Music Genres: Blues, Pop, Jazz, re-issues. Pre-1941 Label: The first label was between 1916-1924. Note the “B” side. The record came in many colors including black, purple, yellow, green, and blue. All have a similar design. A second label redesign occurred between 1924-1928. Note the “B” side. Brunswick design now black and gold shield with a scrolled border. Colors may be tan or purple. Brunswick 1928-1940. Note the phrase “Brunswick Radio Corporation” at the bottom. A Hall of Fame series made by Brunswick came out between 1924-1934. Yellow/Gold in color. 1941-1945s Label: When the record label was sold to Decca in 1944, they adopted the Brunswick label to sell their Collector Series. The collector series is displayed predominately at the top. Decca also released reissues under the Brunswick label. These labels display the phrase “Subsidiary of Decca Records, Inc.”. Brunswick 1944 Record as Subsidiary of Decca Records, Inc.
Post WW2 Label: Brunswick would release 45s and eventually LPs. Notes: Frank Sinatra first recorded on the Brunswick Label in 1939 with the song From the Bottom of my Heart (#8443). Tags: 78 Records, ARC, Brunswick, Frank Sinatra, Red Nichols and his Five Pennies, Warner Bros. The Challenge record label was a budget label for Sears. It was produced from 1926-1930. It was pressed by the Starr Piano Company and would duplicate recordings found on Gennett and Champion records. Most were of anonymous recordings. The Challenge Label sold for 24 cents and are generally of inferior quality. Starr struggled to produce records and, in its final years, Sears used The Scranton Button Company to press the records using master-records from Plaza Music Company. Music Genres: Waltz, orchestra, race-records, blues, country, popular, reprints of Gennett and Champion records. Pre-WW2 Label: This was the only label design for the record production: 1926-1930. Green and Gold with a Knight in Armor imagery. Note: Wikipedia for some reason has the record below but in black and white which is inaccurate. Post WW2 Label: None by Sears. 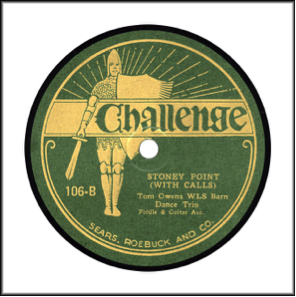 The Challenge Label has an unknown number of recordings but the series consists of 3 digits. Note: Many of the country artists were pseudonyms.